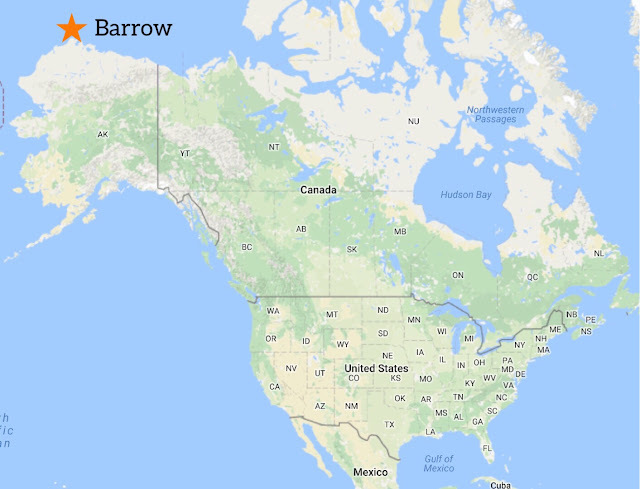 Since the first time I noticed it sitting way up there on top of the North American map, I've been fascinated with Barrow, Alaska. 350 miles north of the Arctic Circle. Surrounded on three sides by the Arctic Ocean and 200 miles of uninterrupted flat tundra on the fourth. With no barriers to discourage it, extreme wind chill is a serious factor in Barrow. I know this because my curiosity about the town often leads me to check out their weather. The sun sets in mid-November and doesn't show its face again for two months. Average temps from November till March hover below 0° F.
So when it was determined that we would travel around Alaska on this trip, we decided to go to either Barrow or Prudhoe Bay, also on the Arctic coast. 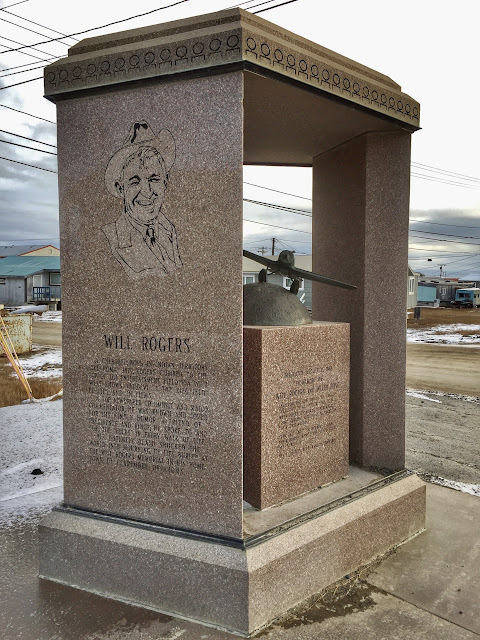 It didn't take much research to discover that Prudhoe Bay is not really a town in the traditional sense, but mostly an oil field and the transients who support it. Moreover, the casual visitor cannot just go to Prudhoe Bay as it is beyond a security checkpoint ten miles south of the coast. All indicators pointed to Barrow, then, and in the end, we were very pleased with the choice. No roads lead to Barrow, so we turned to Alaska Air yet again and booked a flight for late Monday afternoon. We'd be spending only one night and day there, flying back to Anchorage the following evening. Still suffering from the sluggish stupor stirred by Sunday's rail ride, we focused our plans on our 7 p.m. departure from Anchorage, as we letterboxed our way around the city during the day. After finding what we had decided would be the last box of the day near the Captain Cook monument downtown about 4:45, we set the GPS to return to the Homewood Suites, where we had stayed the night before, so we could leave our rental car and ride the hotel shuttle to and from the airport. At 4:55, my phone buzzed with a notification that our flight to Barrow was now boarding at Gate C4. Frantically we tried to figure out what was going on as we shot across two lanes of traffic to turn onto the road toward the airport, which we were coincidentally about to drive past. Nothing had changed. Our flight was and always had been scheduled to leave at 5:35, and indications pointed to an on-time departure. It was our return flight to Anchorage that leaves at 7:00; we had confused the two times. After missing the turn for short term parking our first time through the airport terminal entrance road, we raced back around, zipped into the parking decks and found an empty spot at 5:05. Snatching our coats and bags, we locked the car and took off running toward the terminal. Incredibly, the TSA security checkpoint was totally deserted except for the agents. Due to a glitch with the Alaska Air app, we had both our boarding passes only on my iPad. "No problem," the sympathetic TSA agent assured us. I passed through fine, but Ken's bag needed further inspection (due to a bottle of water deep inside that he had planned to remove before we departed later in the evening). "Go on to the gate so they'll know we're coming," he urged, and I took off speed walking to gate C4. It seemed to take forever, though I was there within five minutes. As I approached the empty waiting area, panting and breathless, the gate agent calmly asked, "Are you Dianne?" "Yes," I gasped, and I explained Ken's delay. She assured me kindly that all was fine and we still had time to make the flight. Just after she radioed the crew on board that we had arrived, Ken walked up, and an Alaska Air agent escorted us to the tarmac where the plane was waiting. It was a 737 Combi (cargo in front half, passengers in rear), so we climbed air stairs to the back door. As we entered, we could see that all seats were filled save two and every overhead bin was closed except those at row 21. Seconds after we stowed our bags and buckled up, the doors were closed and the plane began pushing back from the gate. On our approach to Barrow a couple of hours later, we opened our window shade to see a barren landscape in brown and white, perforated with a web of lines running in all directions where the ice has melted and cracked. The tiny terminal is in the center of town with just enough space for airport business. Barrow's only car rental agency was off site a two-block walk away. Fortunately the temperature had leveled out at 30°, and Barrow's notorious wind chill was giving us a bit of a break. Upon first glance, Barrow (pop. 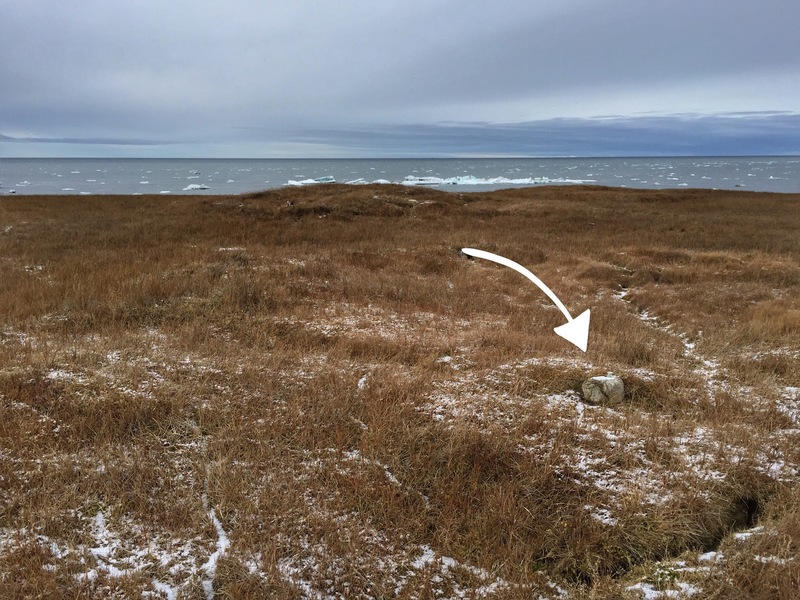 4,212)—with its unpaved streets and prefab buildings—looks as if it may be some temporary outpost on the Arctic tundra. Nothing could be further from the truth. Although the town was formally incorporated under Alaskan state government only in 1959, archaeological evidence indicates that the Iñupiat hunters established a village in the Barrow area as far back as 500 A.D. On the outskirts of town, ruins of semi-underground sod mound homes have been dated to about 800 A.D.
Today Barrow is the economic, transportation and administrative center for North Slope Borough (equivalent to a county unit in most states). The North Slope is home to some 9,600 people (76% Iñupiat) spread across eight villages in an 89,000-sq. mi. area stretching from the foothills of the Brooks Range to the Arctic coast. 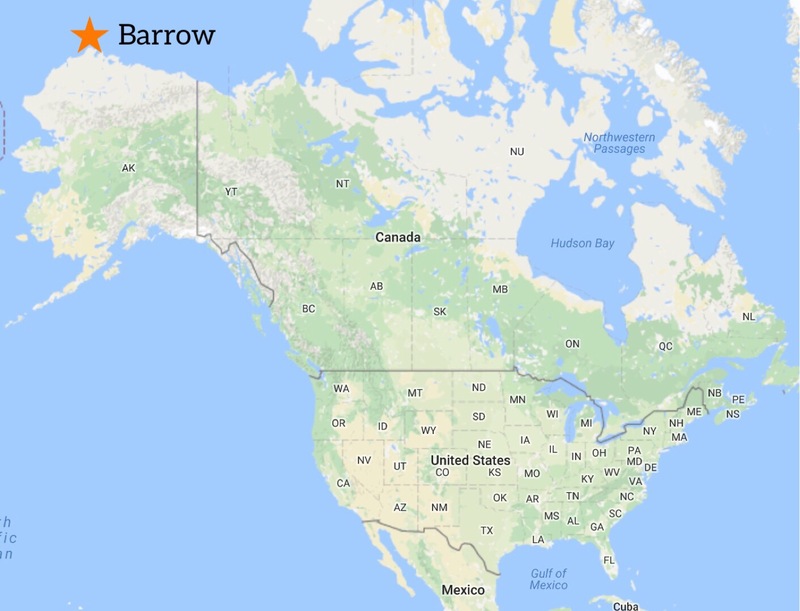 As we quickly learned, Barrow's Iñupiat seem to be fully integrated into the fabric of the society here, unlike the native Inuit in Nunavut's capital of Iqaluit. 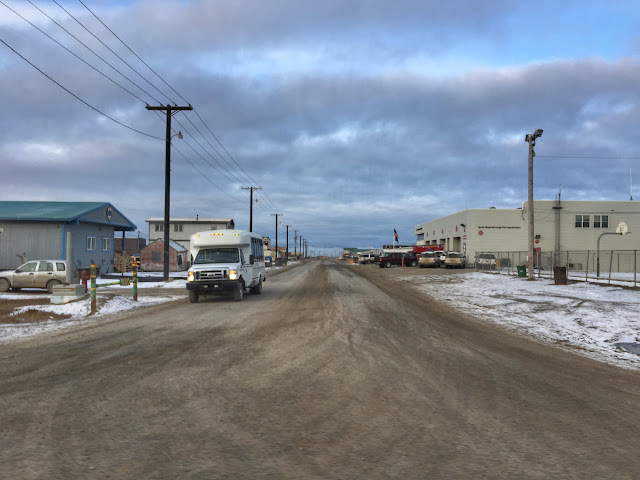 Many enterprises in town are operated by Ukpeaġvik Iñupiat Corporation (UIC), an Alaska Native company which provides social and economic resources to Iñupiat shareholders and their descendants. Both the hotel and the rental car we had booked were UIC enterprises. When we picked up our white Jeep Cherokee, the car rental agent informed us that a Barrow whaling crew had landed a bowhead that day and it had been brought to the butchering spot. When we stopped at the hotel to check in, we met Sherry, a tourist from Arkansas, who also told us about the whale and asked if we wanted to follow her to the location where the flensing was taking place. 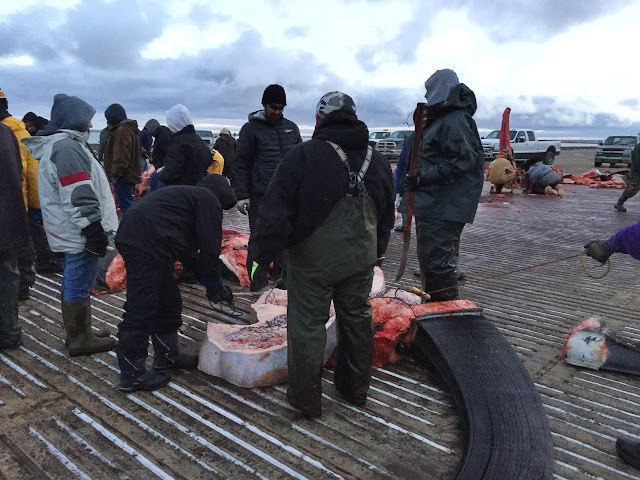 WHALES HARVESTED IN BARROW ARE SHARED WITH THE COMMUNITY. We couldn't pass up an opportunity to see the local community engaged in one of its important rituals, so we drove five miles out of town to the old Air Force runway where we found scores of cars parked and great hunks of butchered whale lying on the grooved pavement. By tradition, captains of whaling crews that were not involved in the catch each send one or two men to help flense the whale and collect a share for their crew. People from the community who are not part of a crew also come and help with the work so they can get a portion. PRICES ARE TWO, THREE, EVEN FOUR TIMES THOSE IN LOWER 48. 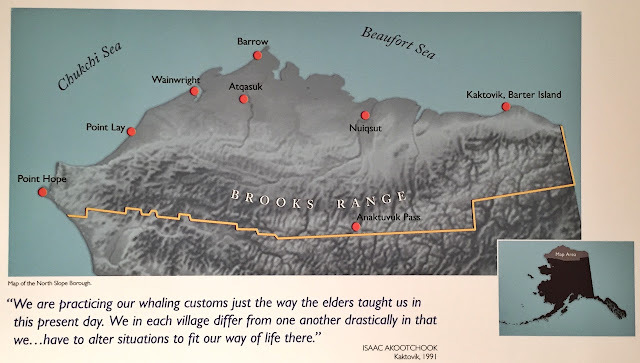 How fortunate for the Inuit that their historical diet supplies nutrients like vitamins A, D and E, which other societies obtain only from cultivated foods. Though we have just tomorrow to spend in this distant outpost, we are eager to learn as much as we can about this very interesting American community.